GDG DevFests are global events showcasing the latest developer products and platforms. Next days it is taking place a GDG DevFest in Heraklion on 15 to 17 of December. It will be opened up to all technologies and active communities in Crete, with tech talks, codelabs, workshops, mini-hacks and demodecks. As for the Business Track sessions there will be an interesting presentation on how to take our first steps as a local business in this Digital Transformation era made by Nikos Kampitakis CEO of Webtrails.gr Digital Agency and founder of Office12 Coworking Space. How can a small, seemingly traditional business go from zero to digital hero? Can you develop a strategy and utilise digital tools to improve your web and social presence, increase your sales and work more efficiently? Is it possible to work with thousands of leads and customers a year from now? 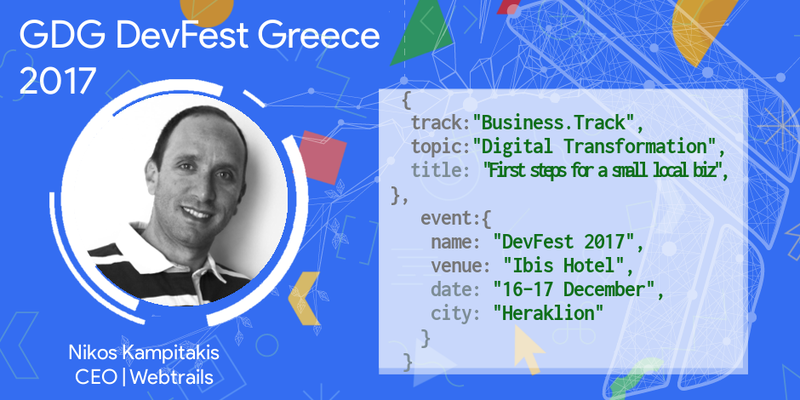 DevFest Greece is opened to everybody interested in getting all the latest news and updates around technology and innovation. If you would like to attend and participate, you can reserve your seat at devfestGR17.